Support Can I output my DV screen to another monitor? Discussion in 'Android Devices' started by spooksmcgee, Aug 10, 2010. 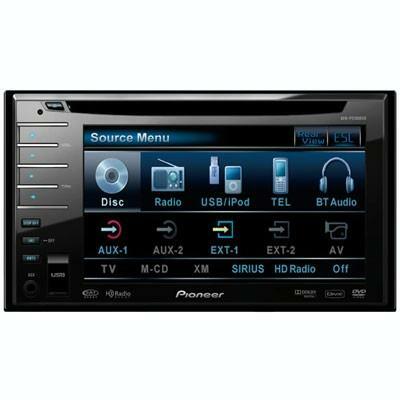 I have a Pioneer AVH-P3100DVD Car DVD Player with inputs for Auxiliary, TV, and an AV input (as seen here. I'm wondering if there is anyway for me to use one of these inputs to export the screen from my Droid to it. The dvd player is touchscreen, but I don't presume I'll be able to actually control my DX with it, but it would be nice if I could show the navigation on it since it is a 7 inch screen. I also currently have my phone setup with the Motorola car mount and it records video everytime I dock it. So it would be nice if that display would show up on my radio monitor in addition to being on the phone. Or maybe be able to play movies and video clips from my phone on the monitor. Before I invest in cables and trying to take out my radio and plug anything in back there, does anyone know if this is feasible? I've tried to plug it just straight into the auxiliary jack on the front of my stereo but that didn't do anything. I assume it will need to plug into the AV or TV input connections if it does indeed work. Thanks a lot! DX has only HDMI out, and only from the oem 'gallery' media player. which is to say, no nav on your 7", no how.